QA Tech-Tips: How to remove "For Other Computer" from your rulesSurprisingly, it's easier than you think! Surprisingly, it's easier than you think! Outlook is a great little e-mail client with a rich feature-set, and I have been using it for many, many, many, years. Like any piece of software, it does have its little quirks and the occasional speed-bump that you have to deal with. For example, migrating your user settings isn't as straightforward as you might expect. 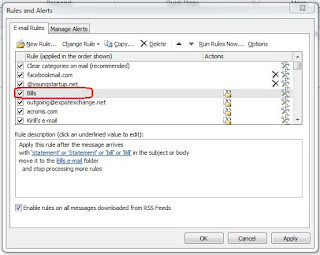 Another little quirk comes when you migrate your rules: It's not uncommon to migrate rules from one machine to another and then discover that - at least some - rules have "For Other Computer" appended to the rule name. What's even more annoying is that there appears to be no way to remove it. Since this has been annoying me for a while now, I decided to search The Usual Fountains Of Wisdom on the internet. Surprisingly, no one seems to have addressed this specific issue. Since there are any number of postings on various fora asking this question, and since it is so easy to fix, I decided "It's Article Time!" Part of the problem is that the vast majority of the Fountains Of Wisdom assume (!!) that if you're using Outlook, you are using it with an Exchange Server. And yes, Outlook is uniquely qualified to work with Microsoft's Exchange Server hosted e-mail. However that's not the only way it can be used, as it works equally well with Pop/SMTP or IMAP mail servers, and it appears that a great many people use it that way. Including your Fearless Article Author; as I have been using it as a Pop/SMTP mail client for years and years, and years. One of Windows' many features is that it can be set up in such a way that users can log in from different machines and still see the same basic configuration. This is done by use of what is called a "Roaming" profile. These are settings that are linked to the user, instead of the machine, and are commonly used in a remote access / Terminal Server type environment. By using the Windows Roaming Profile, a particular user can use any number of different workstations connected to the same server and see the same configuration each time. A great example of this is a doctor's office, where there are computer terminals in each treatment room, and another computer in the doctor's actual office itself. In this case, using roaming profiles, the doctor can go from treatment room to treatment room, always seeing the configuration that he's most comfortable with. What about e-mail? In this case, there may be a difference. While the doctor may wish to view, and perhaps even answer e-mails from any terminal in any one of the treatment rooms, he may want to segregate certain - possibly confidential - e-mail messages so that they download and are stored only on his office computer, instead of any open terminal he may be at. 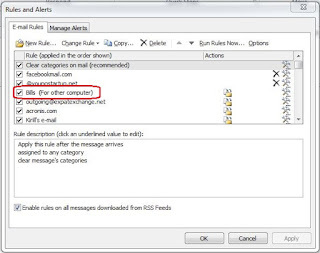 One of Outlook's quirks is that if Outlook is not being used with an Exchange Server, it "automagically" assumes that any rule created should be valid only on the computer that created it. 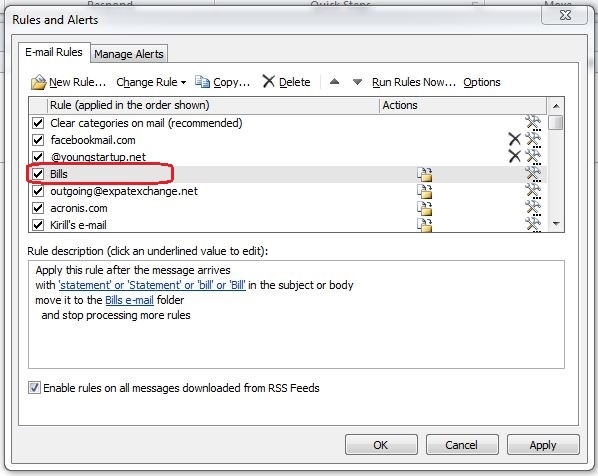 To accomplish this, Outlook automatically sets this attribute for any rule created on a computer that uses Outlook as a stand-alone e-mail client. Sounds reasonable, right? Exactly right - until you decide to migrate Outlook, or your rules, to another computer! At this point, Outlook assumes that any imported rule is not valid on the machine it was moved to, causing rules to silently "break" because they're not being executed on the new machine. Not only do they not execute, they don't tell you they're not being executed - because Outlook "assumes" (!!) that they will be executed on the machine that originally created them. If you're migrating Outlook to a new/different system, you're probably taking Outlook off-line on the old one, so that assumption may not be valid. Once you do this, you find rules labled "For Other Computer", indicating Outlook believes that they are not valid on the machine you're using them on! There is, probably, a Registry Setting somewhere that turns off this "feature", though I have not found it yet. 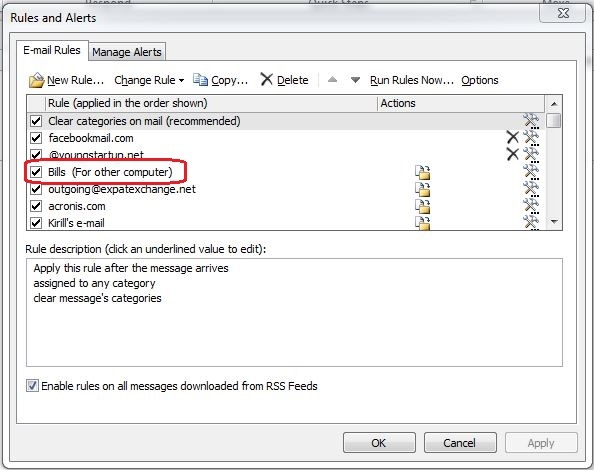 The other way is to open the Rules Manager, go to each affected rule, and un-select "On This Computer Only". Once you do this, and save the edited rule, you will notice that the "For Other Computer" designation has been removed. You repeat this for every rule you have with "For Other Computer" next to it. If you have a lot of rules, I can't tell you how to do this in bulk, but - at the very least - it can be done. And, since it is such a simple fix, I am surprised that no one else has mentioned it! Well, it's been mentioned now - and I hope you find it useful.